Also check out my aesthetic mod, Garden Stuff! Capacity can be further boosted with storage upgrades. Upgrades do not need to be applied in sequence, so you can pick the size you need from the start. Capacity upgrades can be mixed and stacked, if you have sufficient upgrade slots available on your drawer. The effective capacity becomes the sum of the upgrade multipliers. A concealment key will let you hide the item label on drawers, saving render performance. Using a concealment key on a controller will cause it to show or hide labels on all drawers managed by the controller. 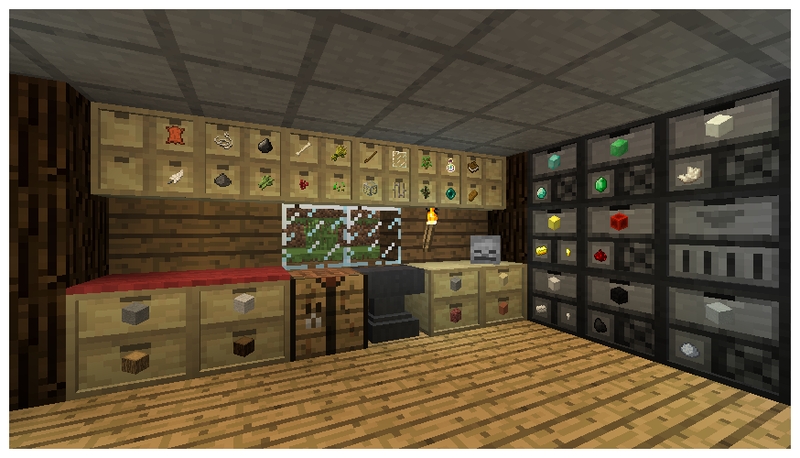 The Chameleon library, listed below, is a required dependency for Storage Drawers in Minecraft 1.8+. 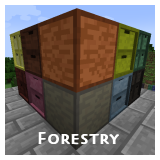 Addon wood packs (in similar flavor to the "Bibliowoods" packs of Bibliocraft fame) have been put together for Storage Drawers. Click any of the icons to be taken to their respective project page. This mod is released under the MIT license. You may include this mod in any mod pack for any reason. No permission is necessary, but I do enjoy knowing when pack authors are using the mod. Taking items from drawers will try to put them directly in your inventory first, then drop them in front of drawer. Obsidian storage upgrade gives drawers higher blast resistance. Fixed framed drawers not stacking if crafted from different material "stack sizes"
Fixed crash when removing a drawer from a controller network while other systems are using it. Fixed framing table allowing players to dupe raw drawers. Fixed framing table refusing to craft in some cases. Fixed status upgrade crashing client when placed on framed drawers. Performance improvement in controller interactions with some mods. Fix permanent render crash when framing drawers with blocks that don't return valid icons. Fixed custom drawers dropping as regular drawers. Fixed various rendering problems with custom drawers. Added 'Personal Key' for owner-private access control. Added CoFH variant of Personal Key using CoFH's friend trust list. Depends on Thermal Foundation. Fix crash when right-clicking controller with empty hand. Controller allows ore dictionary-compatible items to coexist in a bank of drawers. Items will prefer drawers with an exact match over drawers that would cause a conversion. AE2 integration supports this, but other integrations like Logistics Pipes and Automagy will need to update. WAILA stack limit reads infinity when creative upgrades are in place. Possible fix for unusual NEI render crash. Fixed Thermal Expansion integration failing if Forestry or Misc packs are installed but Refined Relocation is not. (update in respective packs). updated zh_TW translation (thanks NatsuArash). Fix crash if Thermal Expansion integration fails. Changed default WAILA item counts to 'JABBA' style (affects new mod installations only). Added integration with Thermal Expansion sawmill and pulverizer. Updated API for wood packs. Fixed crash on creative inventory when Refined Relocation is present but disabled. Removed limit on conversion factors for compacting tier MT API. Added API to expose drawer slot priority. Fixed AE2 integration to respect drawer priorities like normal inventories do. Fixed blocks being deleted when applying a Refined Relocation sorting upgrade to a sorting drawer. Updated zh_CN translation (thanks 3TUSK). Updated zh_TW translation (thanks NatsuArashi). Added Creative Storage Upgrade (~infinite storage; no in-game recipe provided). Added Creative Vending Upgrade (infinite withdrawal; no in-game recipe provided). Added Buildcraft wrench support to rotate drawers, or drop sealed drawers instantly. Added config entry to change range of drawer controller. Improved accuracy of lighting in fast label renderer. Fixed grass blocks and leaves displaying incorrect colors in fast label renderer. Fixed Mariculture tanks distorting world rendering when displayed in a drawer label. Fixed display of drawers in item frames. Fixed inconsistent insert/withdraw hit areas on drawer slots. Added config option to change item amounts in WAILA to stack + remainder format. Fixed logistics pipes inserting items into empty locked drawers (contributed by 1n5aN1aC, who also improved compatibility in the logistics pipes project). Added config option to disable oak fallback recipes. Added guarding to the label rendering to prevent crashing with some mod blocks/items. Fixed fallback recipes creating the wrong drawer type. Fixed fallback recipes sometimes taking higher precedence than wood-specific recipes. Fix status upgrades for "pack" versions of drawers. New 'packing tape' item to tape drawers shut. Taped drawers will keep contents/upgrades when broken for easier relocation. Fixed compacting drawer descending lookups failing in some circumstances. Fixed block label rendering for some users (it would appear to 'sink' into the drawer). Fixed illegible numbers in drawer GUI when using the unicode font. Fixed incorrect recipe for refined relocation version of compacting drawers. Fixed some compacting drawer tiers not working if an associated ore dictionary entry was blocked. Compacting drawers will prefer same-mod materials when looking for more-compact versions. Added several common metals to conversion whitelist (nugget, ingot, block, ore). If Extra Utilities is present, compressed sand will be preferred over sandstone in compacting drawers. Fixed item equivalency bug in compacting drawers for some item configurations. Added several nuggets to the ore dictionary whitelist to counteract TCon oreberries disabling those keys. More recipes use the ore dictionary. Thanks ganymedes01. Fixed thaumcraft aspect labels flickering since last update. Fixed dupe bug with Steve's Factory Manager. Adjusted label rendering with a polygon offset. May eliminate flicker for some users. Fixed regression with Super Crafting Frame, possibly ExU and a bunch of other transport mods. Added package-info to the API directories. 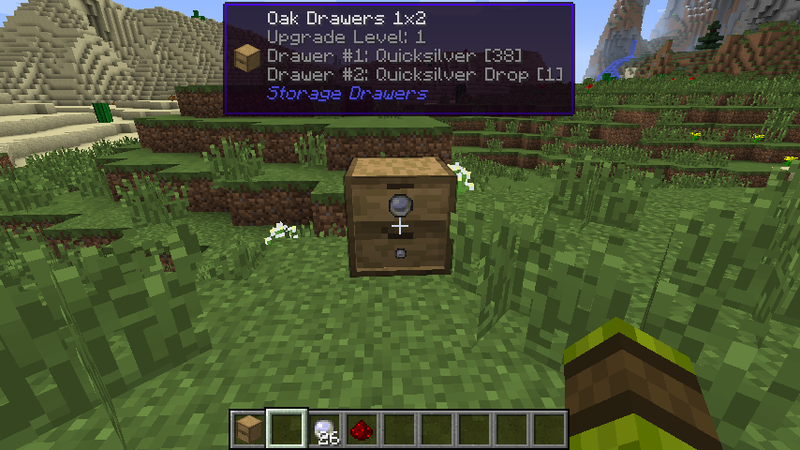 Allow more drawer types in special drawer recipes; better support for addon pack drawers in recipes. Fixed more item voiding when pulling items with Extra Utilities transfer nodes. Fixed regression in ore dictionary matching, causing more items to unify than should be allowed. Ore dictionary matching made even more strict. Any key used 2 or more times by a single mod is no longer allowed for matching. Changed controller routing priority to void -> locked -> normal -> empty. Changed controller to respect routing when manually inserting items. Changed compacting drawers to prefer materials from the same mod during descending lookups*. Fixed startup crash when launching with some versions of Java 1.8. Thanks MineMaarten. Fixed rendering regression where drawer faces would appear black with smooth lighting disabled. Add new Magic Crops ore dictionary classifications to the conversion blacklist. Updated zh_CN translation. Thanks autopsychorhythmia. Added more pack API to support Ancient Trees mod. Fixed Extra Utilities transfer nodes voiding items if there was a stack or less remaining. Fixed partial material loss when filling near-full compacting drawers through AE2 terminal. Fixed void upgrade not affecting manual input. Removed unused "native" inventory slots (performance). Recipes now use "stickWood" in place of sticks. 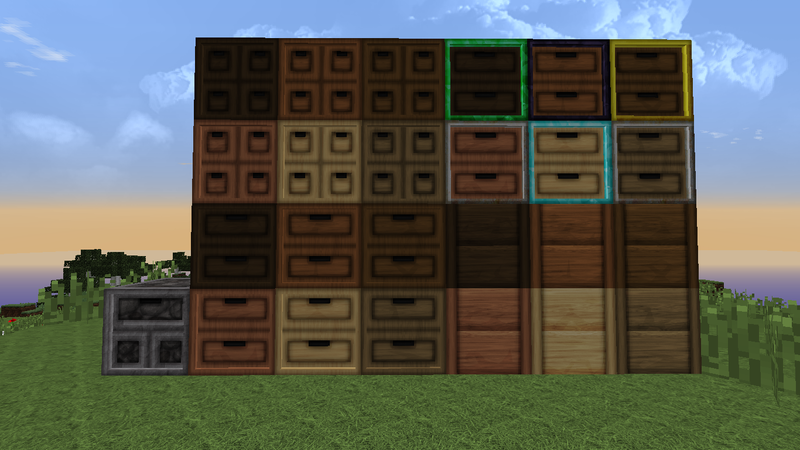 Added pack API for third party mods to directly provide new wood or texture variants of drawers. Fixed crash when trim blocks are enabled and 1x1 drawers are disabled. Fixed Refined Relocation compacting drawers recipe. Changed full drawer blocks to block light. Changed drawers, compacting drawers, and controllers to support custom inventory names. Updated fr_FR translation. Thanks AegisLesha. Add config options to control NEI and Creative Tabs use in wood addon packs. Added fractional drawer API to support Automagy integration. Fixed locking behavior again (this time for controllers, which was the whole point really). Fixed render glitch with half drawers; no more lines splitting the top or back. Fixed locked empty drawers to not accept items through sided inventory. Added 'Concealment Key' to hide item labels on drawers (GPU performance). Use on a controller to affect all attached blocks. Added config option to disable the drawer UI. Fixed lighting render glitch on item labels when certain items are present in drawers. Added inventory UI to see exact item counts and manage upgrades on drawers. Open be shift+right-clicking with an empty hand. Fixed drawers loading with 0 capacity if config base stack sizes exceed 127. Fixed tile entity mapping collisions. Internal changes to support wood style packs. Fixed Thaumcraft aspect icon render for labeled jars and jar labels. Thanks codewarrior0. Log any errors during Tile Entity save operations. Added MineTweaker API to add or replace compacting drawer conversions. Changed controller search to find all connected drawers within a 25x25 cube centered over controller. Changed controller to prefer populating empty drawers closest to controller first. Fixed major item dupe bug with Steve's Workshop. Fixed item insertion bug with Steve's Workshop. Inserting items through pipes/sided inventory will now trigger item conversion until there is less than 1 stack of capacity left in the drawer (quirk shared by JABBA). Added fallback recipes for wood trim blocks using plankWood. Changed sided inventory restrictions to allow all block faces to be interacted with. Fixed void upgrade not dropping when a void drawer is broken. Fixed fallback recipes for half drawers to use slabWood instead of plankWood. Nerfed recipe output for trim blocks (recipe was originally more expensive) and added config option for it. Fix AE2 not recognizing void upgrades through controllers. Fix drawers dropping a duplicate drawer key when broken in the locked state. Fix AE2 not recognizing void status of drawers. Updated ru_RU translation. Thanks Adaptivity. Added Refined Relocation support. Sorting drawers and compacting drawers. Min version required is 1.08b. Added 'Trim' block for decoration and as a connector in drawer networks. Added 'Controller Slave' block to expose more faces as an extension of the drawer controller. Added void upgrade. Any items inserted through the sided inventory will be voided if the drawer is full. Added player interact protection event to left-click (in non-creative mode). Changed lock upgrades to a reusable drawer key. Changed drawer network to prefer filling existing slots with space instead of populating empty slots. Depending in refresh timing, it's still possible for empty slots to get picked. Changed invertShift setting to be client-side instead of server-side. 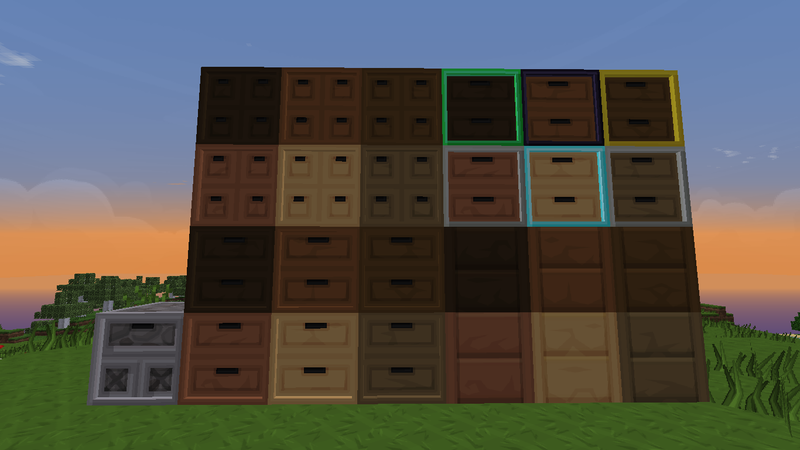 Updated renderer to improve and brighten drawer labels. Locked or voided drawers will display a small indicator on their front trim. Disabled label rendering for back-facing labels (potential performance savings). Third party plankWood that is correctly registered in the ore dictionary can be used to craft drawers. Fixed player inventory not properly updating when dumping inventory into drawers. Updated fr_FR language file. Thanks Mazdallier. Added MineTweaker integration to control the ore dictionary blacklist for drawer conversions. Fix NPE in solid-side lookup when invalid coordinates are passed in (or TileEntity is missing). Thanks gchpaco. Fix stack overflow in drawer controller network lookup AGAIN. The failsafe should be ironclad this time. Thanks gchpaco. Fix drawers not handling unregistered items gracefully. Fix controller crashing if update message is somehow corrupted. Fix controller to initialize its drawer network immediately after placement. Fix controller sometimes not finding all drawers within 12 block range. Updated fr_FR translation. Thanks Mazdallier. Fix possible stack overflow crash when connecting drawer controller to mod pipes/blocks (observed with Thermal Dynamics). Fix crash when placing empty thaumcraft phial/jar into a drawer with thaumcraft integration enabled. Make pipes connect more reliably to the drawer controller? Fix item dupe glitch between compacting drawers and Logistics Pipes (LP support pending on their side). Fix drawers to (once again) not block chests placed below them. Fix server crash when using Mekanism transport pipes with drawer controller. Fix items being voided in some transit systems when the target block is broken or cut off while the items are in transit, and the transit system is connected to a drawer controller. Fix stack overflow crash when placing two drawer controllers next to each other. Fix most pipe systems not connected to a drawer controller on world load. Fix labels to render larger on 1x1 drawers in fancy mode. Fix single drawer block recipes. Double base storage for all blocks (puts storage capacity in line with a vanilla chest). Added 1x1 size wood drawers. Removed L3 status upgrade, and changed L2 to behave like the old L3. All drawers now support all status upgrades. Added 'Invert Shift' option (contrib by tterrag1098). Causes click behavior to match JABBA. Added 'Debug Logging' option. Mainly to help diagnose a reported issue. Fixed rare crash in 'fancy' mode renderer when interacting with some modded blocks. FIX: Ore dictionary matching is tighter and ignores wildcard entries. FIX: Compacting drawers update their front texture immediately when first setting an item. FIX: Drawers no longer lose their contents when pipes try to insert an item into a full drawer and another empty drawer is available. FIX: Drawers no longer void items when pipes try to insert an item into an empty slot that previously held the same item. FIX: Compacting Drawers no longer void incompatible items when pipes try to insert them and not all slots are in use. FIX: Unconfirmed. May prevent packet leaking, but I have never observed the problem. LANG: Added Polish (pl_PL) translation. Thanks nabijaczleweli. LANG: Updated Russian (ru_RU) translation. Thanks grimuars. NEW: Drawer inventories now support automatic item extraction (hoppers, pipes, etc). NEW: Applied Energistics 2 support (via storage bus). NEW: Lock upgrade for drawers. NEW: API to interact with drawers (still being finalized -- talk to me if you're interested in using it). NEW: Config entries to control item input/output and third party mod integration. CHANGE: Network traffic is improved. This is an ongoing area of improvement. CHANGE: 'Fast' rendering now renders blocks with full lighting detail. CHANGE: 'Fast' rendering is now the default rendering mode (existing mod users not affected). FIX: Double-click item entry now works when time is frozen. FIX: Cobblestone, stone, and sandstone added to ore dictionary blacklist. FIX: ExU compressed dirt and cobblestone don't get replaced with higher-tier versions when reloading world. FIX: Status indicators no longer render on wrong slot. LANG: Added French (fr_FR) translation. Thanks Maxdallier. LANG: Updated Chinese Simplified (zh_CN) translation. Thanks ViKaleidoscope. Fixed regression in 'fast' label rendering. Fixed storage upgrades of same tier being applied multiple times. Fixed rendering of fences and other connected block types. Fixed inventories not accepting items with low stack limit through pipes. Fixed compacting drawers not accepting secondary or tertiary items in some cases through pipes. Fixed indicator upgrades not being dropped when breaking drawers. Removed 'level' info from the WAILA tooltip. Updated Korean (ko_KR) translation. Contrib. by puyo061. Fixed crash when drawers interact with Botania hopperhocks (but the hopperhocks still won't work). Fixed 3D item blocks and labels being flipped the wrong way in the east/west directions. Fixed bad rendering interaction between 'fast' item labels and Bibliocraft/other mod TESRs. Lighting is more uniform for 'fast' item labels. Updated Russian translation. Contrib. by merkaba5. Updated Korean translation. Contrib. by Puyo061. Fixed crash when adding some ore dictionary items to compacting drawers. Contrib. by benstreb. Updated translation Spanish (ES_AR). Contrib. by Ines. Added ore dictionary blacklist for overly broad or "list" entries. Fixed seam rendering issues on blocks. Fixed excessively dark AO shading on blocks. Updated translation Chinese Simplified (zh_CN). Contrib. by ViKaleidoscope. Updated translation Korean (ko_KR). Contrib. by puyo061. Added configuration for drawer recipe output size. 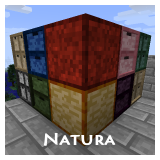 Added configuration to hide extra vanilla wood varieties on creative tab / NEI. Added melon conversion to compacting drawers. Added input support to all sides of drawers except front. 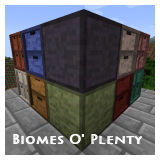 Added ore dictionary support to drawers and compacting drawers. Items will be converted automatically. Fixed crash that could occur when using JABBA dollies^. Fixed crash when using compacting drawers with certain mods present. Fixed reversed slot rendering in 'fast' label rendering mode. Fixed items sometimes not being added to compacting drawers when put in top slot. Fixed recipes being added when respective blocks or features were disabled. Fixed item input no longer working on back side of drawers. Updated translation Russian (ru_RU). Contrib. by merkaba5. Fixes slots being reversed on east/west sides. Fixes WAILA compatibility with new comp blocks. Adds brick, glowstone, clay, snowball, and quartz overrides to comp blocks. Updated translation Chinese Simplified (zh_CN). Adds configuration file and GUI. Modify most stats, disable blocks, and a few global settings. Adds alternate "fast" rendering mode of item labels. Change in config. Adds a new "Compacting Drawer" block for ores and other compressible items. Adds status indicator upgrades in 3 levels. The 3rd level only has an effect on compacting drawers. Changes storage upgrade recipes to use an upgrade template item. Changes storage upgrade multipliers to track the Fibonacci series. New translation: Simplified Chinese (zh_CN). Contrib. by D-dur. Fix crash with automated transport of some mod items into drawers. Added double-right-click to add all compatible items from inventory. Fixed item duplication bug when using Ender IO pipes (and maybe other mods). Fixed item transfer bug when using BuildCraft pipes (and maybe other mods). Fixed buttons, fences, and other partial blocks not appearing on front of drawers. Fixed drawers of any color dropping as oak. Fix server crash related to pathfinding and render ID. Fix crash with some mods that override stackLimit functionality. Fix item rendering on drawers when Fast Graphics are enabled (thanks dmillerw). I like the look of this actually. More aesthetically pleasing than barrels. Nice! 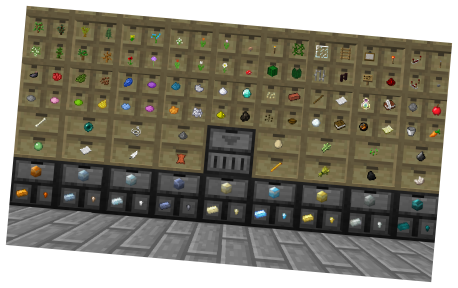 Ooh, I was looking for something like this to store all my Botania ingredients for flower/rune crafting in. Nice. I heartily approve of this! 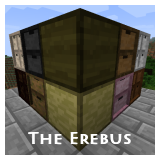 Regrettably I'm stuck in 1.6.4 because of the modding rift that 1.7 created, but I'll keep this in mind for when FTB packs finally make the jump. It's just so much more elegant and modern than most aesthetic storage, and it has all the ease of use I've come to enjoy from JABBA. The barrels aren't bad. I think they were pretty well done and had to make some trade-offs in design. I will probably make some small tweaks here too, once I've had more time using them. OpenComputers parts, RedPower parts (from another time), potion ingredients. Those are just some of the areas where I want easy access to crafting items. Thanks. We started using JABBA on our server earlier this month, and I really liked the convenience of it. I needed something more compact for my various work areas, but the barrels will still handle my bulk storage needs. Hi there great mod. Been testing it with my private pack and got a crash from it. Actions: Putting thaumcraft quicksilver in a 2x2 storage drawer. Going to hazard a guess and say that it's actually Thaumcraft that's causing the crash. Storage Drawers is checking to see what the maximum stack size of Quicksilver is, and Thaumcraft is responding by going "AAAAAAAAAAAAA" because it didn't properly implement this very important function. I'll still have to take a look and see if I can avoid a crash on my end. Being defensive and all that. I found a bug: When you break an upgraded drawer in creative it only drops the last upgrade. I have an idea: Add compatibility for WAILA. Oh and this mod is very good. Upgrades don't stack, so if you apply an iron upgrade and then a gold upgrade, the iron one is lost. It's intended behavior. Waila (What am I looking at) is a mod by ProfMobius that integrates NEI with the tooltip to give extra information. 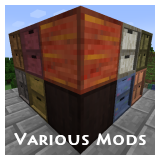 An example for this mod would be how many items are in each drawer. http://www.minecraftforum.net/forums/mapping-and-modding/minecraft-mods/1289765-waila-1-5-2 is a link to waila's MCF post. This of course is just a suggestion as the mod as is is amazing. Update is out - fixes two crashes and a rendering bug in fast graphics. Everyone should update right away, especially if running on a server. I will also look into WAILA. Thank you for the translation. It'll be included in the next version. Dude what a simple (probably not on your end) but very functional mod. Waila would be nice but not necessary! Good news on the Waila front. Another mod author (dmillerw on GitHub) sent me a pull request with Waila integration. Once I pull it down and check it, I'll put together another build. New version is out. This adds Waila support, a mostly complete Russian translation (due to a couple new language entries being added), and fixes a drop item bug. I am also considering ways to display some used capacity information outside of Waila. If you think you've got a particularly good idea, let me know.